By default, Internet Explorer will "remember" data you type in forms on websites / web pages; in the case of login forms, the browser will offer to remember your user name and password as well. But what happens if you typed the wrong user name or data in a field? 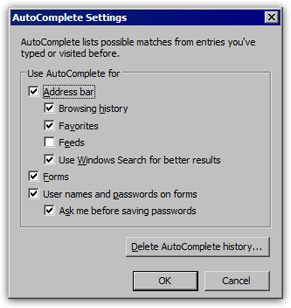 In this tutorial, we will show you how to delete autocomplete entries from Internet Explorer 8, 7, 6, 5.5, or 5 (removing autocomplete entries is identical). We will also cover the special case of deleting a remembered user name from a login form. You will also learn how to quickly delete multiple auto-complete entries in both browsers, and how to delete all autocomplete data (through Internet Options). Note: this technique works for Internet Explorer 8, 7, 6, 5.5, and Internet Explorer 5 - and will likely work in Internet Explorer 9 as well. Click Yes to the " Windows has a password stored for this user name. Do you want to delete the user name and password? " question/confirmation, and Internet Explorer will permanently erase this user name (and password) from your list of autocomplete suggestions. To quickly delete multiple autocomplete entries at once (or close to), just keep your mouse cursor near the second autocomplete suggestion, and repeatedly hit the Del key! You will see each autocomplete entry deleted one after the other. 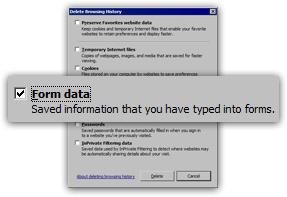 In Internet Explorer 8, press Ctrl+Shift+Del to quickly open the "Deleting Browsing History" dialog: uncheck all checkboxes, with the exception of "Form Data - Saved information that you have typed into forms", which should be checked. Click on the Delete button, and Internet Explorer will remove all autocomplete currently stored. Click OK to close this window and OK again on the next to return to Internet Explorer and apply your new autocomplete settings. From now on, autocomplete will be disabled until you manually re-enable it.